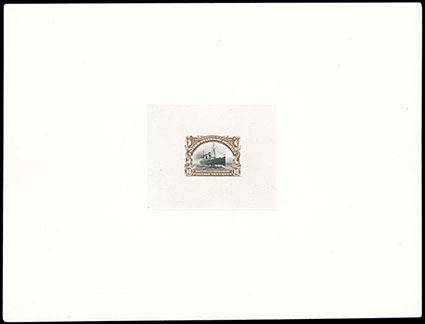 1901, Pan-Americans complete, large die proofs, on India die sunk on card (approximately 150x200mm), each with blue serial number on reverse, rich colors throughout, all fresh and pristine, Extremely Fine and choice. A SUPERB COMPLETE SET OF THE 1901 PAN-AMERICANS LARGE DIE PROOFS. 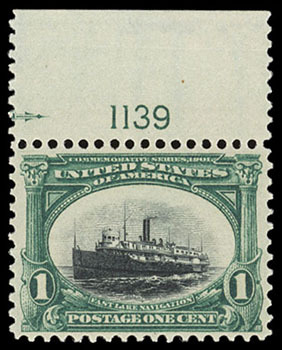 1901, Pan-American, 1¢ green & black, top margin plate number "1139" single, o.g., never hinged, gem centering amid balanced margins, rich deep colors, Extremely Fine to Superb; with 2006 P.S.E. certificate. 1901, Pan-American, 2¢ carmine & black, o.g., never hinged, perfectly centered and encompassed by large evenly balanced margins, rich radiant colors and remarkable freshness, Superb, an outstanding never hinged gem; with 2010 P.S.E. certificate Graded (Superb 98, SMQ $1,300). 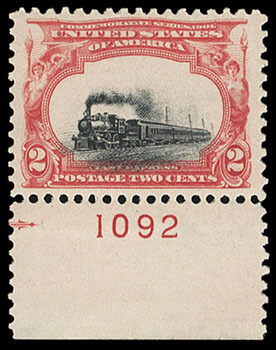 1901, Pan-American, 2¢ carmine & black, showing downward shifted vignette which impinges the letter tablet at bottom, bottom margin plate number "1092" single, o.g., never hinged, well centered amid wide margins, Very Fine and choice; with 2005 P.S.E. certificate. 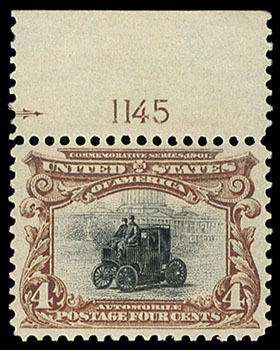 1901, Pan-American, 4¢ deep red brown & black, top margin plate number "1145" single, o.g., never hinged, excellent color and centering, Extremely Fine and choice, a lovely gem; with 2000 P.S.E. certificate. 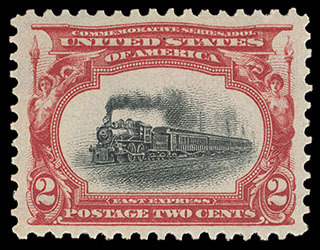 1901, Pan-American, 4¢ deep red brown & black, top margin single, o.g., never hinged, strong colors, wide margins and choice centering, Extremely Fine; with 2012 P.S.E. certificate Graded (XF 90, SMQ $350). 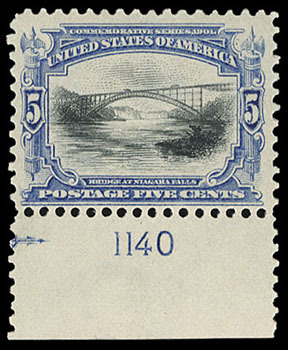 1901, Pan-American, 5¢ ultramarine & black, bottom margin plate number "1140" single, o.g., never hinged, intense deep colors on bright paper, Very Fine and attractive, a striking plate single. 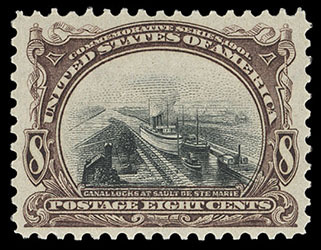 1901, Pan-American, 8¢ brown violet & black, o.g., never hinged, perfect centering, rich colors on bright fresh paper, Extremely Fine to Superb, a choice gem; with 2018 P.S.A.G. 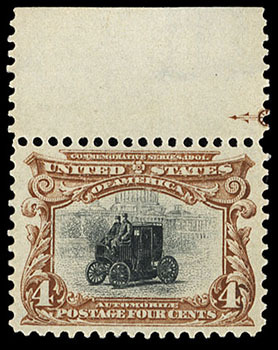 certificate Graded (95, SSV $1,150). 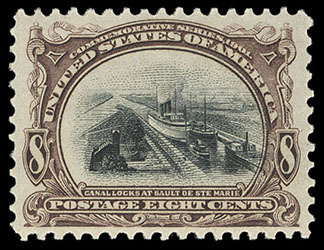 1901, Pan-American, 8¢ brown violet & black, o.g., never hinged, perfectly centered, rich colors and very fresh, Extremely Fine and choice, a lovely gem. 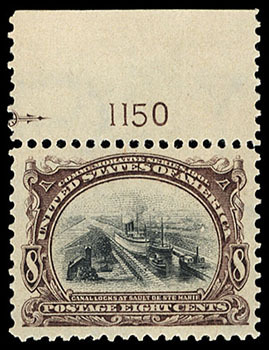 1901, Pan-American, 8¢ brown violet & black, top margin plate number "1150" single, o.g., never hinged (very slight short gumming at top left), well centered amid large margins, strong colors, Extremely Fine; with 2005 P.S.E. certificate.